The first time I visited Key West was last year as part of our cruise on the Brilliance of the Seas. It was definitely my favorite port-of-call. While there, we visited the Truman Little White House, the Southernmost Point, and Mile Marker Zero. These were some amazing places, but there are many other things that we didn't get to do that I will be telling you about here. The Truman Little White House is very close to the cruise port. It takes about 10-15 minutes to walk there from your ship. Tickets for tours cost up to $15 per person and include a tour of the house, the botanical area, and more! If you don't want to spend money on tickets for a tour, then they have a free room for you to look around in and learn all about President Truman. The house also includes a gift shop with some very funny and interesting political items. You can get directions from the cruise port here. 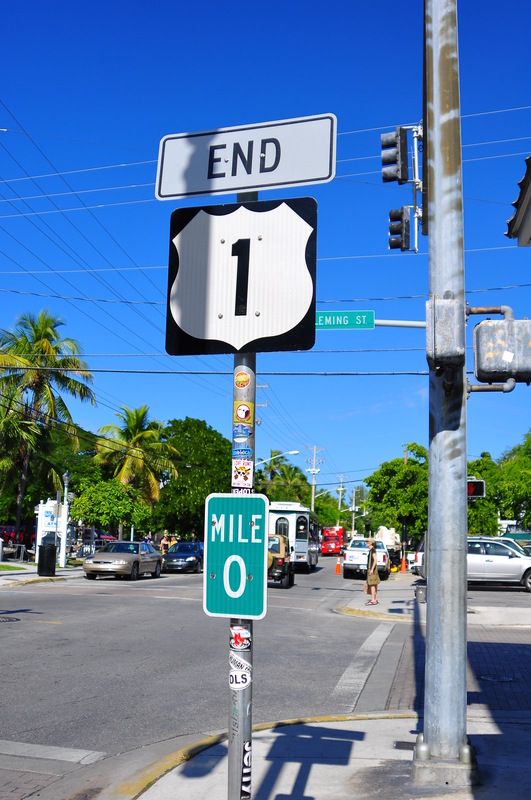 Mile Marker Zero is the first highway mile marker for US Route 1. Now you might think this one is boring, but I know that I, and many other people, find it very interesting. People have come from all over the world and left their mark on this sign with a sticker. After visiting this monument, there are plenty of stores around it where you can get Mile Marker Zero shirts, hat, signs, key chains, etc. Mile Marker Zero takes about the same amount of time to walk to from the the cruise port as Truman's Little White House. For the directions to Mile Marker Zero, click here. The Southernmost Point buoy marks the southernmost point of the continental United States. It also marks 90 miles to Cuba. This one is really far away form the cruise port. You might want to rent a golf cart that they have available or take a taxi. There are usually a ton of people waiting to take a picture with it, so I recommend going there first thing, and then making your way back. Like at Mile Marker Zero, there are a lot of stores around that have Southernmost Point shirts, hats, key chains, etc. The directions to the Southernmost Point can be found here. Tip: If there is a line with a guy offering to take a picture of you and your family, you don't have to wait in that line. You can just walk up and get your picture and leave. It says nowhere that you have to wait your turn for the picture, and it's not worth the time to wait when you can just take a picture. Kermit's Key West Key Lime Shoppe is a store in Key West where you can get key lime flavored everything. These products include candy, pie, soap, jellies, juice, wine, salsa, sauces, snacks and more! Kermit's is a disabled-veterans owned small business. They support three different charities by donating parts of their earnings each year. I highly encourage you to make a visit their shoppe! Even if you don't like key lime, you can buy something and have it shipped to a friend who does in order to support them! The directions to Kermit's are found here. The Conch Tour Train is the best way to tour Key West. It is a 90 minute narrated tour that visits Key West's top attractions. The tour includes Ernest Hemingway's house, Truman's Little White House and more! The tour is a tribute to Henry Flagler's "railway over the sea." The railway over the sea brought the railroad to Key West in 1912. 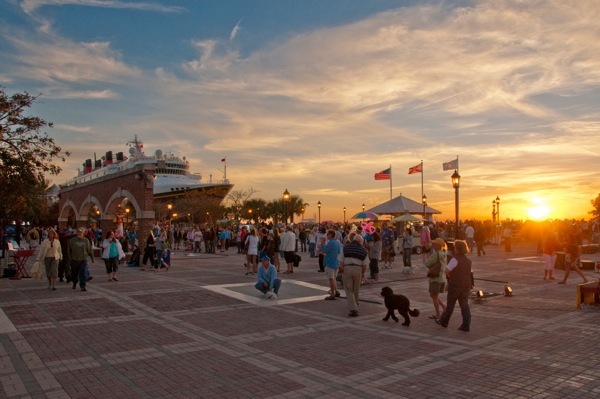 The tour starts at the Front Street Depot and ends 90 minutes later at Mallory Square. Directions to the Front Street Depot can be found here, and you can book the tour here. It is very close to the cruise port. Mallory Square is a shopping mall that is right there when you get off your ship. There you can shop at many shops unique to Key West, eat at unique restaurants, and enjoy the beautiful Florida sunset. Directions to Mallory Square are found here. 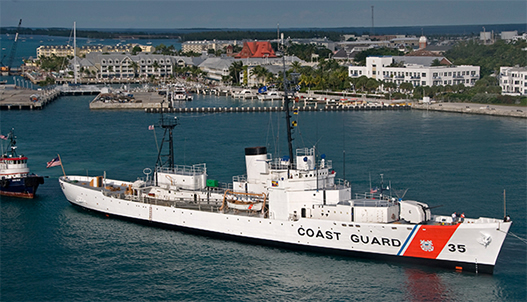 The U.S. Coast Guard Cutter Ingham Maritime Museum is a museum that lets you explore the U.S.C.G Ingham. The Ingham is the only only Coast Guard cutter afloat today to receive two Presidential Unit Citations for extraordinary heroism. It is definitely one of the most interesting museums in Key West. I highly recommend it. Directions can be found here. This is another attraction that you might want to take a taxi to. 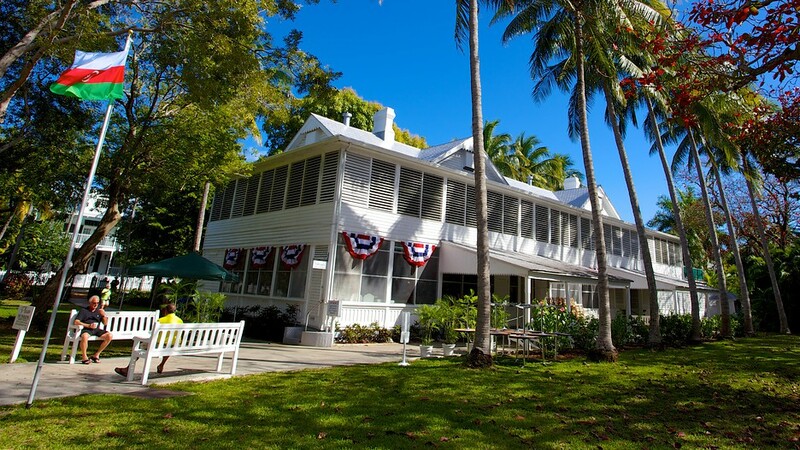 Ernest Hemingway's home is one of the most popular tourist attractions in Key West. Writer Ernest Hemingway wrote here for more than 10 years! This tour allows you to visit the rooms where the famous writer once wrote! The tour also allows you to see his beautiful gardens! Directions to his house can be found here. Once again, you may want to get a ride here, since it is about a 20 minute walk. This tour allows you to spot dolphins and over 600 species of marine life. This three hour tour allows you to sail-away form Key West and explore the crystal blue waters of Florida. The first stop is at a wild dolphin playground where you can watch bottle-nose dolphins play, jump, and feeding in their natural habitat. The second stop allows you to jump out of the catamaran into a coral reef, where you can explore all of the beautiful marine life. There are also free unlimited soft drinks available on the boat. You can book the tour here. The tour departs from Galleon Resort and Marina. Directions can be found here. This no-certification-needed scuba diving tour is a great way to explore the beautiful blue waters of Key West. They will provide all of the equipment, and instructors will teach you how to use it and guide you along the tour. Once underwater, you can explore the world's 3rd largest coral reef. They even give you a GoPro to use during the dive for FREE! Book the tour here, and the directions to the meeting place can be found here. You have to get a ride to this meeting place because if you don't, then it is a 2 hour walk. Below are some things that can majorly improve your day in port! I highly recommend all of them!